Whether you call them daubers, dabbers, or even dobbers… there’s no question that these specialized bingo markers are “must have” equipment for all hall bingo players. And, of course, as such an important feature of the game, they have made their way into online bingo too. Number 10: What are bingo daubers anyway? Bingo daubers are essentially a specialised type of ink pen used to mark paper bingo cards. 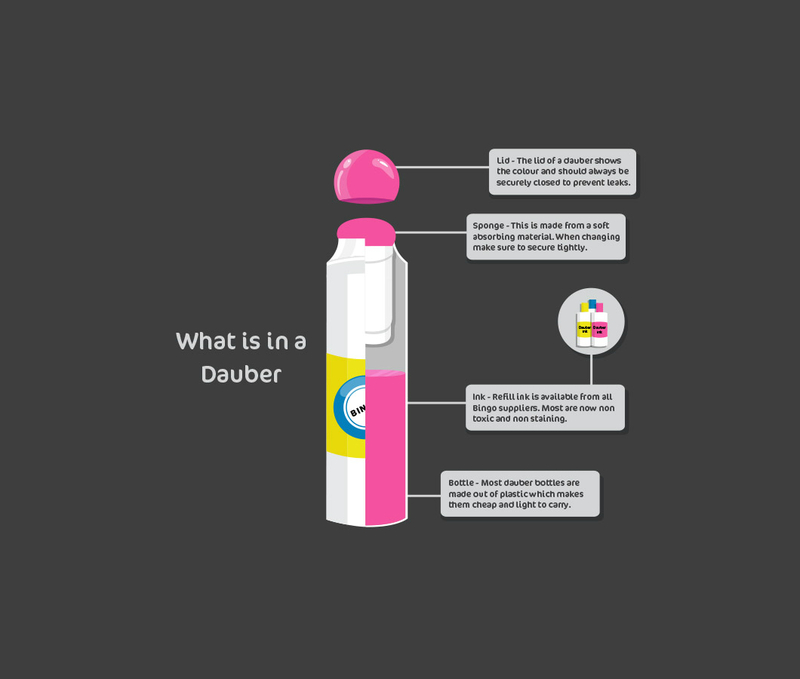 More than a felt-tipped pen, a dauber is a small plastic bottle with a sponge-like tip and filled with translucent ink. As numbers are called, a player uses the dauber to mark each called number on his or her cards with a transparent circle or other mark. Inexpensive daubers can be purchased in bulk and generally contain about 45 ml of ink. But real bingo aficionados are likely to prefer daubers with a larger capacity. Daubers of 80 to 120 ml are designed to last from four to eight bingo sessions without needing to be refilled. Number 9: Where did bingo daubers come from? You may already know a bit about the history of bingo. Dating all the way back to Italy in the 1500s, it made its way to France, Great Britain, and other parts of Europe in the 1700s. In the early days, as the numbers were called, players marked their cards with beans – leading to the game’s first 20th century name: Beano. It was during the early 20th century that the game found its way to the shores of North America and quickly became wildly popular – with tournaments often sponsored as fundraisers by churches and NGOs. During the height of this mass popularity, the downside of using beans as markers quickly became apparent. All it took was a slight bump of the table to create a jumble of beans and a slew of inaccurately marked bingo cards. It’s only in the late 20th century that bingo daubers came about as a way to ensure that one clumsy bingo player wouldn’t ruin everyone’s day. Number 8: Are there different kinds of daubers? There are disposable daubers, refillable daubers, plain daubers, and novelty daubers. You can find daubers with simple round nibs and daubers with nibs of every shape under the sun – even including the sun (along with the moon, stars, hearts, footballs, superstars and superheroes)! Number 7: What makes a good bingo dauber? The ink should be transparent, so you can see the numbers after they’ve been marked. It should be large, colourful, and easy to find in your bag. Last but not least, as bingo players tend to be a superstitious lot, you might want it to be lucky! Number 6: What kind of ink is in bingo daubers? Just as there are many types of bingo daubers, there are many types of ink to be found inside them. Standard bingo ink is the most cost-effective type and commonly used by bingo halls and by players who don’t want to make too loud a statement. Even though the colours are not as vibrant as those found in fluorescent daubers, they are not necessarily subdued – with bright options including magenta, aqua, purple, pink, and orange. If you want to refill your daubers yourself, this is the type of ink you’ll use. Fluorescent ink is the favourite of players who want to leave a more vibrant mark on bingo society. With colours such as coral, lilac, lime green, and teal, fluorescent daubers are perfect for the young or the young at heart. A more recent evolution for those who truly want to sparkle is the glitter-filled ink found in some novelty bingo daubers. 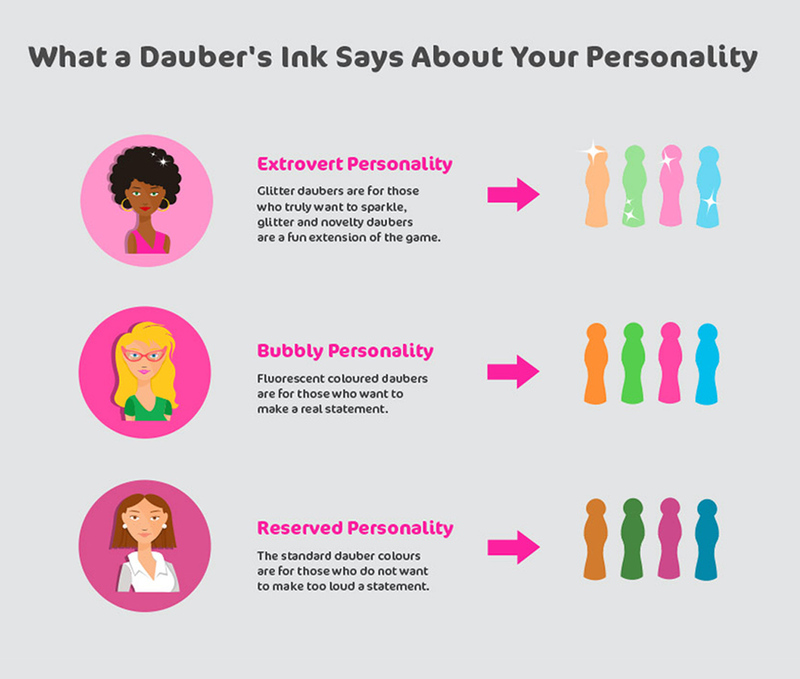 With safety as an especially important consideration for players with young children and pets, it’s good to know that most dauber ink these days is non-toxic. But to be sure, you should always check the dauber or ink packaging itself or the manufacturer’s website. Number 5: Where can I buy bingo daubers? Despite bingo’s immense popularity, you can’t generally find bingo daubers in stores. If you’re happy with the basics, you can usually find them available for purchase at bingo halls. (Be sure to arrive early!) But the best bet for finding the daubers that are perfect for you is online: at bingo supply websites, Amazon, and even eBay. The variety is endless, and if you shop around, you are sure to find attractive prices. Number 4: Can I make my own bingo daubers? Number 3: Are bingo daubers just for bingo? Bingo daubers have found their way into the hands of creative teachers, crafters, and do-it-yourselfers everywhere. Perhaps the most popular use for daubers outside the bingo hall is in the classroom. With just one quick internet search, you’ll find a host of printable worksheets, art projects, and educational activities designed for use with bingo daubers. Crafters use bingo daubers in their scrapbooks and for quickly inking rubber stamps. There are even those who use bingo daubers to dye their hair in all the colours of the rainbow. A mother’s nightmare! Number 2: How are daubers used in online bingo? The online counterparts of bingo daubers include both the manual and autodaub varieties. On the manual side, most online bingo sites offer the player a choice of “virtual” dauber shapes and colours. So even though you are playing without paper bingo cards, you can still express your personality through your dauber. For many players, an even more important evolution is autodaub. With this option enabled, your cards will be marked automatically as the numbers are called – allowing you to play many more cards at once. Often paired with an auto-sorting feature that places the cards closest to winning at the top of your screen, autodaub ensures that you will never miss a bingo. Of course, some players prefer to mark their own cards (sometimes or all the time), so be sure the site you choose allows you the option to turn autodaub on and off as you like. For the true multitasker (what mom isn’t a true multitasker? ), some online bingo games – Wink Bingo among them – ensure that you win whenever you have a winning card, whether you autodaub or not. Number 1: So really, are they daubers, dabbers, or dobbers? The most common spelling in the industry is “bingo daubers”, with “dabbers” as a close second. But all three spellings are commonly used, so feel free to pick your favourite. 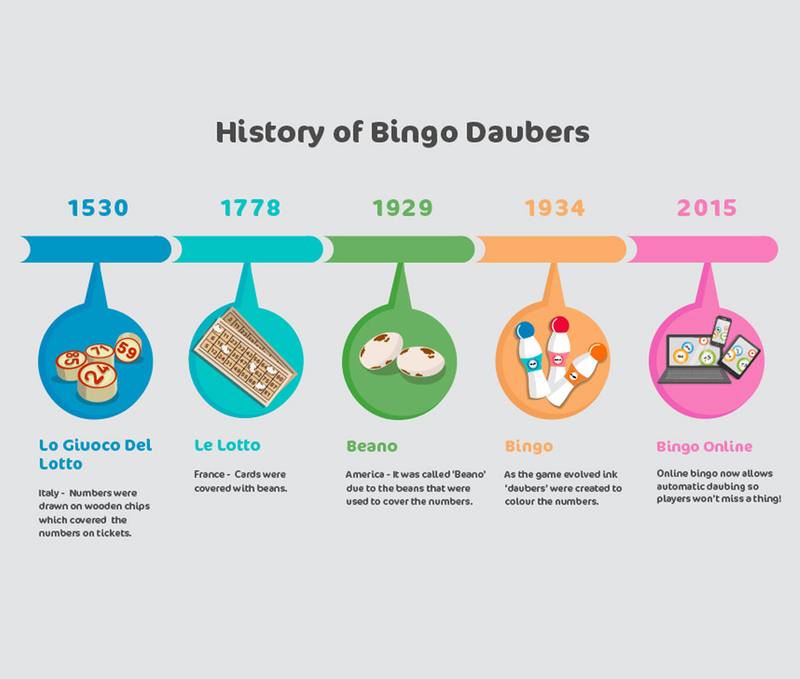 Whatever you call them, and whatever dauber you choose, the most important thing is to enjoy your bingo experience… so keep playing… and daub on!